How can I correct my eye position after an orbital blow out fracture? I’m sorry to hear about your congenital facial asymmetry. I understand from your history that you suffered an orbital blow-out fracture, and that you had it repaired. Subsequently you are now experiencing headaches, and vertigo as a result of a shift in your eyeball and eye muscle position? 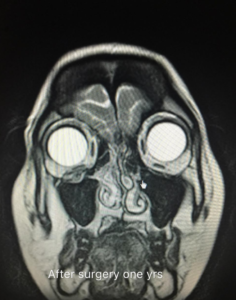 It is very difficult to comment on your specific case, as the causes for vertigo and shifting in your eyeball / eye muscle position are so variable, especially after significant trauma and subsequent repair (which appears to have been performed with a very thick bone graft as seen in your CT scan)! Such causes may be due to the initial trauma, or surgery performed by your initial surgeon that subsequently affected your eye position or eye motility. In particular you would need to do a Hess chart (to document eye movements in detail) that will help ascertain whether it is your eyeball position, movement or torsion that is causing your problem. It may be difficult to comment on your specific condition, but it sounds exactly like a patient that I am managing right now! 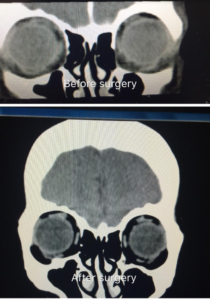 This unfortunate patient sought me out for a second opinion after unsuccessful fracture repair in Penang, Malaysia with an autologous bone graft placed in the floor of the orbit (Similar to your situation, she had a high bone implant placed that was compressing the tissues between the eyeball and the bone-graft – this is also seen in your CT scan). She was deeply unhappy after surgery as she experienced very subtle eyeball movement restriction and torsional diplopia in all positions of gaze. Hess chart examination for this patient however, did not reveal any abnormality at all. 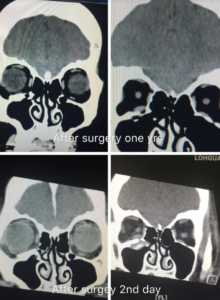 Detailed examination of her post-fracture repair CT showed that she had significant reduction of her orbital space likely due to the height and position of the orbital floor implant likely causing compression and hence a lateral shift in the inferior orbital tissues! I have arranged surgery for this particular patient in the coming months, and hopefully I will be able to restore her induced anatomical abnormality. I’ll keep you informed of the outcome, but in the meantime, I would be delighted to assist with detailed evaluation and further advice as to how you should approach this problem which must be extremely distressing for you. I’m a plastic surgeon with extensive experience dealing with facial and orbital fractures from Tan Tock Seng Hospital previously. I am currently in private practice. The corrective surgery you had for the orbital floor fracture did not adequately correct the floor defect. In addition, the corrective implant is too thick, resulting in impingement of the Inferior rectus muscle. This causes your diplopia, nausea, tinnitus and giddiness. It is a typical occulo-tympanic reflex. In addition, from the photos, you have obvious right enophthalmos/sunken eye. What you require is a corrective orbital floor surgery, with removal of the previous implant and the use of a properly placed orbital floor mesh. This is a relatively simple surgery which would take 1-1.5hrs under general anaesthesia. Please feel free to contact my clinic should you require more information. Thank you for your question. First a disclaimer: I am not a plastic surgeon nor an opthalmologist, but I would try to answer your question based on my exposure to the topic during my trainee days. From your question, it seems to me you had corrective surgery; I presume for your craniofacial condition? This commonly entails precise repositioning of the facial bones by creating breakages in the bone and then piecing them back together in the new position. Would this be the “fracture” you are referring to? An actual orbital blow out fracture involves typically the floor and the inner wall of the orbit (eye socket) near the nose. Depending on the extent of the fracture, this may lead to loss of support for the globe (eyeball) which may result in the eye being in a wrong position. It may also lead to entrapment of the muscles which usually allow our eyes to move in all directions. When this happens, the movement of the two eyeballs cannot be coordinated properly/ there may be a restriction in movement of the eye / double vision (usually on looking up and down). This may then lead to giddiness, nausea, and headache as the brain is not able to process the images from both eyes correctly. I would recommend you consult a plastic surgeon, who would be able to assess if you have a sunken globe (enopthalmos) and whether you have limitation in your eye movement. Further investigations including a CT Scan of the facial skeleton may be required (sometimes with 3D reconstruction for precise surgical planning). Thereafter your plastic surgeon should be able to pick up any cause for the entrapment and may proceed to corrective surgery. If you previously had surgery done, this may involve removal of previous implants and placing new ones. If you suffered a fresh orbital blowout fracture, then the plastic surgeon may proceed to place a mesh (usually titanium or other inert material) to cover the defect so that the eye and its muscles can lie in the right position. Occasionally, the plastic surgeon may also involve an opthalmologist specialising in orbital fractures. With regards to surgery to correct your eye position, this is definitely possible. An implant that is made specifically for you based on the other normal side can be produced and inserted to reconstruct your orbital floor as closely back to the original as possible. These implants are made using computer aided design and 3D printing technology. While this gives us the best chance of reconstructing your orbit and repositioning your eye, it doesn't guarantee resolution of your symptoms. Hope this helps. Not the answer you're looking for? Browse other answers tagged Plastic Surgery Eye & LASIK or ask your own question now FOR FREE.